MilesToGo: LPG is the most recent app in the MilesToGo series. 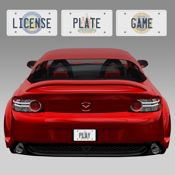 With this app, the user can set up and play multiple license plate games...A default game (called Game 1) is set up the first time the user runs the app (the name can be changed). The date/time when each game is created is stored (and displayed on the main page). The user can select license plates for states, districts (Washington, D.C.) and territories of the US, and provinces and territories of Canada. The game comes with sample license plates from all states, provinces, territories, and districts. Some basic facts about each state/province/territory/district are provided with the sample license plate. The user can take a picture of the license plates (and replace the default image with their own). It is possible to take multiple pictures of each plate (so that the user can photograph specialty plates, different styles, etc...), and all of the images will be displayed in the app. Also, the GPS coordinates for the first image are stored, so that the user can see where each plate was spotted. The status of an individual state/province/territory/district can be reset (to show the default image and basic facts)...which will result in any previous images being deleted from the app. It is also possible to reset the status of every state/province/territory/district at once. This game was designed to include the main features that LPG enthusiasts wanted to have. If you want other capabilities added, just let us know and we'll do our best to build them into the next version. This app has been designed to take advantage of the larger screen size of the iPhone 5/new iPod touch, but also looks and feels great on earlier iPhone/iPod touch models (iPhone 3GS, 4, 4S, any iPod touch with a camera). This app requires iOS 5.0 or higher. A version for iOS 4.X and 3.X will also be available (for iPhone 3G and iPod touch (without a camera) devices).